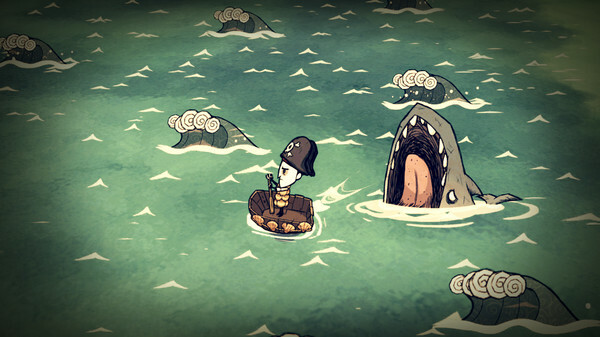 Don’t Starve: Shipwrecked, the second major content expansion for the hugely-popular roguelike survival game is headed to PlayStation 4 very soon, developer Capybara Games has announced on Sony’s PlayStation blog. Unlike the original game and its Reign Of Giants expansion, series creator Klei Entertainment have handed development duties over to their friends at Capybara and given them almost free reign to release a new expansion from a fresh perspective, says Capybara’s lead writer and director, Dan Vader. Looking for a fresh take on their beloved survival game, Klei asked Capy if we’d be interested in creating a new expansion. They gave us no guidelines or rules for what we could do with a Don’t Starve game — just a blank canvas in the form of their amazing video game with a wickedly-committed community of diehard fans. Jeez, pretty trusting bunch, those Klei-folk, eh? Having already entered Steam Early Access in December last year, the seaworthy Shipwrecked expansion introduces a massive helping of brand new content for players to explore and experiment with in their quest to survive its harsh environments. After jumping into the Don’t Starve deep end and throwing around ideas for where to take it, what stuck was the idea of transplanting the Don’t Starve characters and mechanics to a whole new, built-from-scratch world: one of sun-scorched desert islands featuring brand new biomes, creatures, bosses, weapons, and ways to avoid starvation. We have to say, trading swamps, deserts and those infinitely-annoying hounds for a new life on the seven seas sounds like a treat, but don’t expect survival to be any easier – you can’t even take to water until you’ve scavenged the materials to make your own boat. If there’s not some sort of Kraken-themed boss lurking beneath the water’s surface in Don’t Starve: Shipwrecked, we’ll be very, very surprised. Argh, matey! Bring on the release date!